Where pine beetles go, wildfire is sure to follow. Beetle-kill trees are dehydrated down to a reddish brown color. Forests that have been under attack long enough are filled with the perfect tinder for disaster. A bit of lightning, a careless campfire, or a tossed cigarette can create a conflagration that will burn hotter and faster than a beetle-free forest. Trees that had been infected and killed over the past few years were a large part of the fuel that fed the recent High Park and Waldo Canyon fires in Colorado. These fires each set records as being the most expensive wildfires in Colorado history. Between these two fires more than 600 homes were lost. 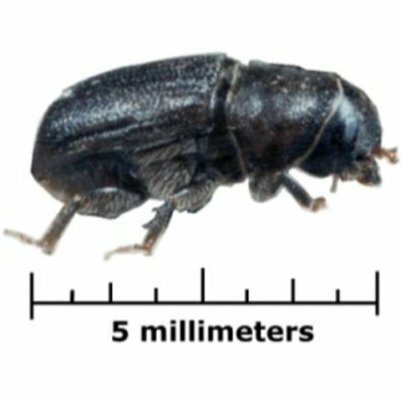 For a tiny black beetle about the size of a grain of rice, it has a huge effect on humans and the environment. Their usual role in the ecosystem is to take out old and weaker trees to encourage new forest growth. Dry summers and mild winters, such as there have been recently, increases beetle populations and the beetles begin to attack healthy trees as well. Methods for managing the spread of the mountain pine beetle includes cutting down of infected trees. Small lumber operations have made use of the opportunity to turn the infected trees into a usable product. The resulting lumber has an unusual blue-gray coloring to it because of the fungus the beetles carry. Spraying for the beetles also works, but only on a small-scale, due to environmental concerns over the impace of the insecticide on the ecosystem. Other combat methods include the use of pheromones to "guide" the beetles to target trees where they can be contained and eliminated.